It has had a BMS reset, the CCC and CDC have dropped between the first and second samples. This was probably the dealer doing the updates for the firmware. You may find that the SOH drops back to what it was before. I think you are overly cautious only charging at 6A, especially if you fast charge it at other times. If you think about when driving, 7kW is nothing. Elmil wrote: The screenshot on the previous post made me check some statistics from my old 2015 Soul. 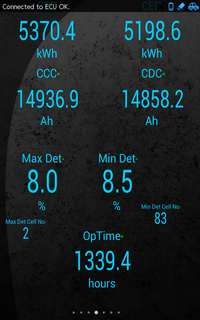 The interesting numbers are the Max and Min Deterioration Cell numbers. They show Max det #2 and Min det #8. My car had a change in deterioration numbers at 148 occations. The Min det was #8 in 76%, the Max det was #2 in 28% and 22% had both as above. 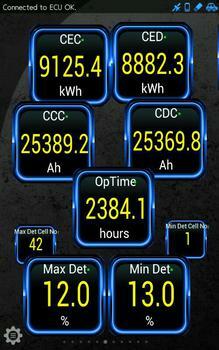 notfred wrote: I think you are overly cautious only charging at 6A, especially if you fast charge it at other times. This is the experience I had with my Peugeot iOn, on the iOn foruns there was some people doing this, and they had the lower deterioration. Also on the iOn, deterioration was like a clock, it came down every 27 to 32 days, always the same amount. In that Portuguese forum, people are very confident the heat kills the batteries. I fast charge when/if I need to; on the iOn I fast charged 3 times in a year, I don't believe this is expressive for degradation. Any spreadsheets someone would like to share? I have had two notable upward spikes in my deterioration numbers over the last four years. Both times the values initially spiked and inverted, but came back down again in the months afterwards. The Min and Max readings have not inverted any other time. Recently a German user has seen the same spike and inversion. I drove fast over the mountain 110km/h, decelerating hard before the speed cameras. Very unusual driving speed and style for my car. There was a spike up in my readings a month ago. It occurred immediately after driving fast 100km/h over a mountain. The Min and Max reading initially reversed. This is the second time I have seen this in 3 years. Both times were driving fast over the mountain. It is something I rarely do, so I doubt this is coincidental. Am having a chat with German user ToyToyToy. His car has also shown the Min and Max reading reversed. ToyToyToy wrote: Last week I was checking the values and was happy to see that Max-Det was 15.8%, which is almost the same as per end of December with 15.7%, although January was a bit cold over here (at night a few degrees below zero). Today, I was at a fast c harger (haven't been there for at least 2 months) and checked the values again: 18.3/18.3/18.4 (Max/Avg/Min). And yes, Min was higher than Max, which is very strange. I was shocked to loose almost as much capacity as during the entire last year with 20,000 km. Hopefully, just the BMS is mis-calibrated and will recover after the next calibration. JejuSoul wrote: ...My conclusion is that driving very fast, or just fast up a steep hill causes high battery stress which can degrade the battery much faster than normal. This is not a problem if you only do it occasionally. 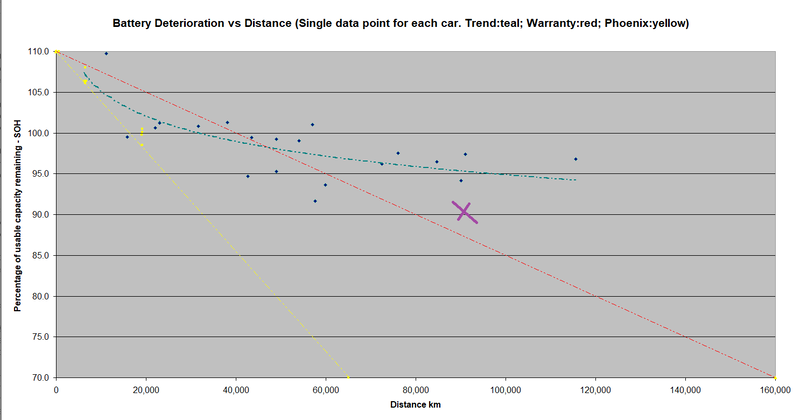 And yes I think the deterioration values on your car will go back down just like mine did. ToyToyToy wrote: Now that you mention it.... just before I took the reading I was driving quite fast, 130-140 km/h, for 15 minutes or so, since we were late for an appointment. This probably caused the drop of the values. Vancouver, British Columbia, Canada - pretty EV friendly. Rarely below 0C (coldest -10C once) and rarely above 30C. The vehicle is stored in garage at home and at work that usually does not fall below 10C or go above 25C. I don't do pre-heating or cooling. - Typical weekday is 70km round trip. - Typical weekend is 30-100km per day. - My unabashed driving style is lead foot on the accelerator and feather on the break - EVs are fun, life is short, why hold back. - I have the EVSEUpgrade, and am fortunate to do almost all my charging at work at about 2.5 kW for free. -Weekday charging cycle: Arrive in the morning - charge to 100% by mid afternoon, leave early evening, arrive home with 75-80% SOC, park overnight at home no charging, drive back to work, arriving with 50-60% SOC. So, it has been at 100% daily for 2-4 hours. -Weekend I'll keep it below 80% SOC if I do need to charge on our regular 7kW EVSE and do it at 2AM, but I try to hold out to arrive at work on Monday with >40% SOC. -Chademo: Less than 10 times over the past four years, just haven't had need although we're fortunate to have many here in BC. -Technical issues over its life: the on-board charger failed in February 2017 - had to wait a month for a replacement. Not fun. So - any thoughts on how my stats compare to the cohort of other Soul EVs? Any idea why my CEC CED are so low? Your car is not doing as well compared to the other cars on this thread. - reason = your lead foot. But you are doing way better than cars in places like Arizona and Texas - reason = BC climate is near perfect for EVs. 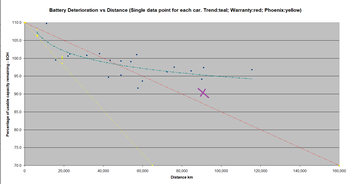 In the graph below your car is roughly marked with the purple cross. You're above the red warranty line, which means it won't qualify for a new battery. This last night I tried to force a calibration on the battery; no success. 5 days ago I used a fast charger to 94% and in the last 5 days I used the battery until yesterday I arrived home with 18%. This morning around 6 it finished charging, but still no deterioration values. I think my error was I haven't started with 100%. I think I read somewhere the process is 100 lower than 20 and to 100% again. My question is, must this be done in one day? Or since this morning I was on 100% I can take it to lower than 20 in a few days and then, back to 100? So this time it worked good. For a calibration to occur we must start from 100%, go below 20%, and charge back to 100%.